There were seemingly good reasons why President Gerald Ford was criticized for pardoning President Richard Nixon. But, fortunately after he passed away three decades later, President Ford was widely praised. The reasons have everything to do with his ability to inspire values – values we could use today in business and government. More on that later. First, my memories of interacting with him, and how and why I came to revere the leadership qualities of the 38th president, who passed away in 2006. Thirty years earlier as a young journalist, I reported on President Ford and later met him socially. Now, my sense is that he leaves a remarkable legacy of leadership with healthy attributes for public officials and businesspeople to emulate. But the value of President Ford’s public service was not apparent to me in 1974. Like the thunderous criticism by millions of Americans over his pre-emptive pardon of President Nixon for his role in the Watergate cover-up, I was cynical, too. However in 1977, my eyes began to open wide about President Ford’s qualities when I met him poolside at an outdoor press reception for him in Rancho Mirage, CA. At the time, I was in management as the news director at an all-news radio station. When I introduced my then-wife to the former president, I was immediately impressed. “Glad to meet you, Mrs. Corbell,” he responded. It was a simple sentence but it was an authentically sincere statement, unlike I had ever experienced. It wasn’t what he said. It was how he said it. His listening skill, eye contact and his deeply ingrained politeness were awe-inspiring. Then it hit me – “This man is special,” I thought. Unlike the conspiratorial President Nixon, President Ford didn’t view journalists as enemies. Much of what I learned about President Ford occurred at that desert resort. Palm Springs was the original desert resort Mecca. That changed as Rancho Mirage and other towns in California’s Coachella Valley grew. Rancho Mirage is where President Nixon wrote his 1974 State of the Union Address. It’s also where I covered the marriage of Frank Sinatra to Barbara Marx in July, 1976. Later that year, despite the pardon, there was enormous intrigue over President Ford’s retirement plans following his election defeat. That was especially true for me as a young journalist in returning to my desert home where I spent my childhood. There were rumors that President Ford would retire to there, but there were many conflicting reports. The Palm Springs area was special to me. Known as the golf capitol of the world, it was also the playground of Hollywood stars and for presidents from both political parties starting with visits by President Harry Truman. Raised by middle-class parents there in the 1950s-1960s, I had been dazzled by the presence of President Dwight Eisenhower and the visits of Presidents John Kennedy and Lyndon Johnson. In 1964, President Johnson stayed at the Palm Springs home of Louis Taubman, an oil and real estate magnate for whom my mother worked. President Johnson was in town to negotiate a Texas land dispute with Mexico’s President Adolfo Lopez Mateos. Former President Eisenhower was a customer of my dad, who managed the meat department at a Safeway store in Rancho Mirage. I was astonished to learn my dad had refused the former two-term president’s request to cut his own beef behind the store’s meat counter in accordance with Safeway policy. As a Democrat, my dad didn’t refuse Ike’s request for political reasons – his motivation was based on principle – just like President Ford would later demonstrate. Years later, after my career took me back to the desert as an ambitious, young news director of an all news radio station in December 1975, I began to cover some heady stories. Although it was essentially a retirement community, working in the sunshine was a golden opportunity for a young journalist. It afforded me many opportunities to report stories on iconic luminaries, such as then-presidential candidate Ronald Reagan, Nancy Reagan, House Speaker Thomas “Tip” O’Neill, Frank Sinatra, brand designer Raymond Loewy, golfer Arnold Palmer, California Governor Jerry Brown, and Noah Dietrich who was the architect for the financial empire of billionaire Howard Hughes. Plus, as the freelance correspondent for the now-defunct NBC/NIS radio network and legendary CBS radio station, KNX, in Hollywood, I eagerly anticipated the opportunity for national exposure to report stories. I was consumed by the desire to get a scoop on President Ford’s retirement plans after he was voted out of office. I had covered many noteworthy stories, but none was bigger than the former President of the United States. There were all kinds of intriguing rumors. I chased all of them. But every lead led to a brick wall. I nearly became discouraged. Every person I contacted for information was secretive. But I was determined to be as indestructible as the President Ford family in order to get my scoop. Like a last-second bid to win a Super Bowl game, I threw a Hail-Mary pass: I telephoned former Palm Springs Mayor Frank Bogert, a Republican who sold real estate and was known to be colorful and blunt. Finally, after countless hours of investigative research, I was proud to break the news locally and nationally. President Ford planned to retire to the desert. Having worked in that exciting environment, such experiences gave me a gratifying perspective, and the opportunity to measure President Ford’s qualities as a leadership role-model. Courteous, respectful behavior. Everything I had read about President Ford’s nice-guy attributes are huge understatements. He wasn’t syrupy. He had an almost-indescribable, commanding but unassuming presence. As he looked and talked with my then-spouse and me, I felt the awesome power of his wisdom and the warmth of his listening skills. Power of discernment. Following Watergate and during the Vietnam War in 1974, there were no integrated solutions for the aggravating 12 percent inflation, a recession, an energy crisis, and an overall uncertain economy. 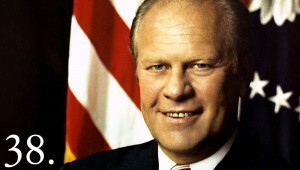 While Americans and the federal government were preoccupied with bitterness and malice from the lingering wounds of both events, President Ford realized Watergate would continue to plague the nation. Fortunately, President Ford understood the big picture: he had a working knowledge of economics and was an expert on domestic affairs. Laser-like mission focus. In addition to the Nixon pardon, there were widespread negative news reports about President Ford: His stumbling while disembarking from Air Force One, a poorly worded statement about Communism in a campaign debate with his opponent Jimmy Carter, and his errant golf tee shots hitting spectators. On the Saturday Night Live TV show, Chevy Chase got career boosts from satirizing about President Ford. President Ford didn’t complain and the White House didn’t unleash a PR counter-attack. Instead, President Ford good-naturedly socialized with Chase. In reality, President Ford was a competitive golfer, had been a football star in high school and at the University of Michigan, and was a scholar at Yale Law School. He was mentally tough. And when he was in Congress as House Minority Leader, he was known as the consummate dealmaker. He wasn’t easily side-tracked. Honesty. In retrospect, it was ludicrous to assume President Ford had made a deal to pardon Richard Nixon in exchange for ascension to the highest office in the land. As the Vice President, he was destined to assume the presidency, even if Congress took months to impeach President Nixon. He was honest about what a sick America really needed when he issued the pardon even though it would cost him him his job. Tenacity and courage. Much has been written about President Ford’s tenacity. It helped him deflect the Reagan challenge to his election bid in 1976 and nearly helped him to overcome a 25 percent deficit in his campaign for a second term. Let us not forget his courage in the post-Watergate era. Equally impressive was his devotion to First Lady Betty President Ford who determinedly overcame her bouts with breast cancer and alcoholism. So, President Ford, thank you being a great role model for leadership. We could use you now. From the Coach’s Corner, see dozens of leadership articles here.